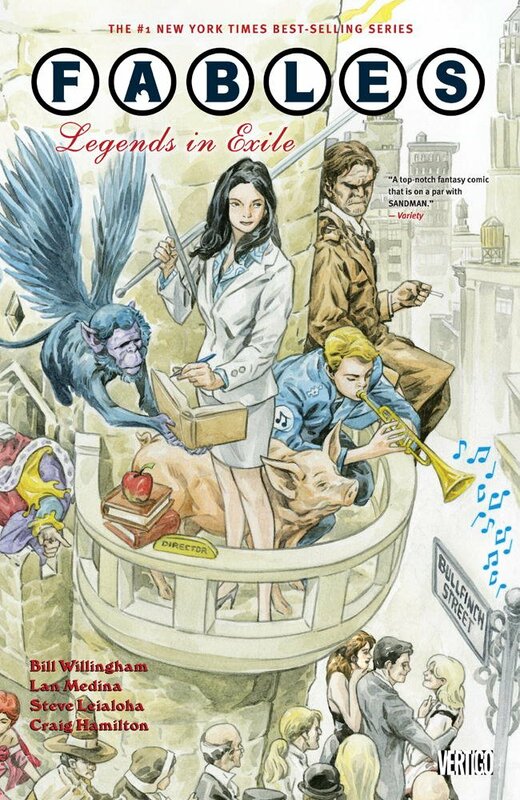 Fables is a multiple Eisner Award-winning comic book series written by Bill Willingham. It tells the story of characters from fairytales, folklore, and mythology who have been ousted from their homelands by the mysterious Adversary. They have been living in hiding in New York City for centuries, attempting to blend in with the non-magical human population. They stick together as a tight-knit community called Fabletown. Many of them live in an apartment building called the Woodland Luxury Apartments, which also houses the Business and Security offices of Fabletown, their own town hall and sheriff’s station. Any Fables who are unable to pass as human, such as animals or monsters or giants, live on The Farm in Upstate New York. Spells are in place to keep it hidden from Mundys, short for Mundane, the human natives of this world. People like you and me. Well-known characters appear in the books, but with slightly different histories than you may remember. And of course, these tales take place long after the time of the stories we know, so things have changed quite a bit. Snow White and Prince Charming are divorced (he’s just TOO charming…and can’t resist sharing that charm with all the women he can); she is the Deputy Mayor of Fabletown, handling the day-to-day operations for the Mayor, King Cole; Bigby Wolf, aka the Big Bad Wolf, is the Sheriff. And we can’t forget Bufkin, the flying monkey librarian from Oz. In the first collected volume, Legends in Exile, Snow White’s rebellious sister, Rose Red, has been murdered. So, the series introduces us to these unique characters through the telling of a complicated murder mystery, with the classic surprise ending. A bit of a warning: these are not fairy tales for small children – there is a very bloody murder, sexual situations, and adult language. These books are definitely for a mature audience, teens and older. The series isn’t new – it started in 2002 and is currently ongoing with monthly issues of the comic. 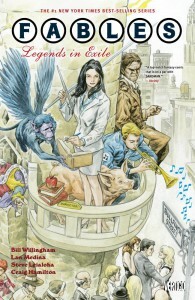 Sadly, Willingham has announced that he will be ending Fables this year, with issue #150. But, it has been released in collected volumes, 20 so far. Each volume collects 5-12 issues of the comic book, making it very easy to start and catch up. I’ve not caught up myself yet. But, I am really enjoying this interpretation of traditional fairy tales and stories. The characters are well developed and the writing makes you want to learn more about who they are and how they got where they are today. The artwork is very good, and incredibly detailed in many places. I may have spent way too long on the pages in the Business Office of the Woodland Apartments, which is magically larger on the inside than you would expect, trying to find every little detail of the accessories that the Fables brought from their Homelands to our world. I think that’s Excalibur in the stone back there…behind the Magic Mirror…and is that Captain Hook’s Jolly Roger floating by?